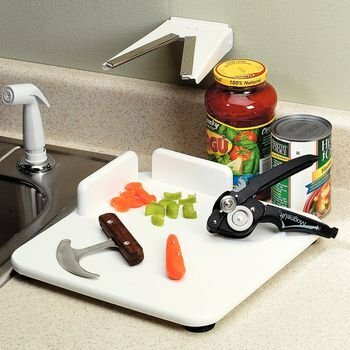 One-Handed Kitchen Helper Kit These specially selected products help anyone who functions with the use of only one hand. The 4-piece kit includes a Rocker Knife (1411), a Zim Jar and Bottle Opener (3086), a Hi-D Paring Board (3099), and an EZ Squeeze One-Handed Can Opener (9205-78, below). Latex free. The 4-piece kit includes a Rocker Knife (1411), a Zim Jar and Bottle Opener (3086), a Hi-D Paring Board (3099), and an EZ Squeeze One-Handed Can Opener (9205-78, below).